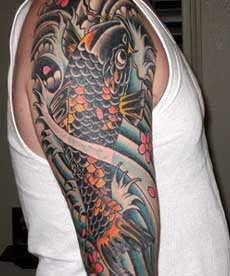 This koi fish tattoo is an icon for all those hard working individuals, who are striving to remain above and grow beyond. All of us are like carps, swimming in the ocean full of tides and fighting against all odds that life has put before us. 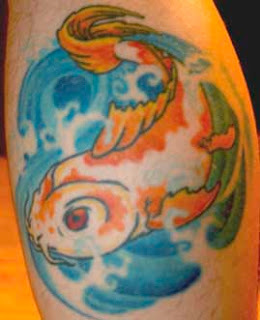 Koi fish wishes us good luck.The beautiful blue koi fish on the right leg of this man is swimming along with crossing the tough tides and leading him to a challenging shore of success with strength and determination. So, let us see when does the carp finally reach at the dragon gate.